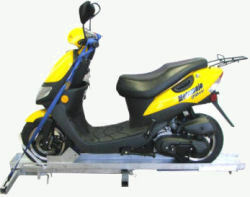 A scooter ramp is one of the best motor scooter accessories you can buy if you think you'll need to transport your motor scooter without actually riding it. 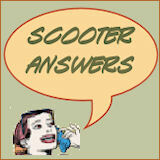 I realize you may have arrived here because you were looking for information on ramps for mobility scooters. If so, I apologize. 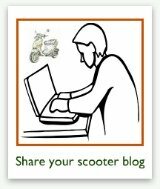 You won't find it here, as this site is dedicated solely to motor scooters, rather than electric mobility scooters. A more appropriate title to this page might have been "motorcycle ramps". Anyway... if you think you might need to take your scooter somewhere — rather than ride it — a ramp might be one of the motor scooter accessories you consider buying. Of course, if you're only going to need to transport it once, such as home from the dealer after you buy it and before you know how to ride it, then a more cost effective solution is probably just to rent a little trailer from UHaul or a similar rental place. 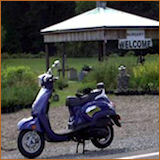 But, if you plan to take your scooter on vacation in your RV or other such activities where you might want it with you, but not want to drive it for some reason, then you may need a way to transport it (and to get it into the transport vehicle). Some RVs come with compartments appropriate for hauling scooters and ATVs. And of course, the good old pickup truck can be used for that purpose too. 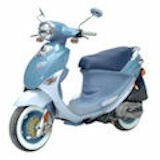 Another option is to tow the scooter on a small trailer behind your car, SUV, RV or truck. And one other option I've seen is to install a small single track rack on a trailer hitch on the back of your vehicle just wide enough for the tires of your scooter. It looks like the picture at the right. No matter what you decide is right for you and your lifestyle, chances are, you're going to need a ramp to get your scooter into it. Even fairly small scooters like my 125cc Genuine Buddy weigh 200 to 300 pounds. 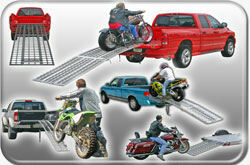 Unless you have 2 or 3 strong-armed friends/family, ramps can make things a lot easier! There are a few different types of ramps that can be used for scotoers, and which type you ultimately choose will depend on your needs and preferences. Some ramps, like the one pictured at the top of this page, are all one piece. 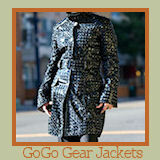 Others fold in half or even in thirds, which probably makes storage and transport a bit more convenient. Some have a narrow single track, while others may have a wide enough ramp that you can walk up next to your scooter as you move it into place. A scooter ramp also comes in different lengths. The longer the ramp, the gentler the slope and the easier it will be to push your heavy scooter uphill. If you pursue the back of the vehicle rack pictured above, it may even come with a mini-ramp that enables you to wheel, rather than lift, your scooter into place. Some of those racks might tilt instead. How do you find a scooter ramp? Well, your best bet if you like to see what you're getting and make sure it's adequate for your particular scooter is probably to buy locally. 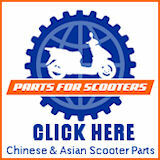 Your nearest motorcycle shop is probably a good place to start. Most scooter drivers will probably never have a need for a scooter ramp. But if you do, then hopefully this page has helped you to find what you need!